I was watching a Korean drama a few days ago when the protagonist in that drama was burn in a fiery explosion. A year later (in the drama) after undergoing plastic surgery, the protagonist came out with a new face and hardly any scarring. I had to keep reminding myself that it was just a drama, and that it did not portray real life. Many people do not understand that once skin is burn, the skin will not be the same anymore, depending on the degree of the burn. There is a general misconception that plastic surgeons can make the skin normal and smooth as what you see on television. Most of what we see on television are merely illusions. Once the skin is burn, depending on the severity of the burn, there will be scarring, hypertrophic scarring and in certain cases keloids. From ancient times, the lotus has been associated with purity and beauty as it is difficult to believe that such a clean and beautiful flower can emerge, untainted by the dirty and muddy water. As a result of this, the lotus is often mentioned or used as a symbolism in many religions. 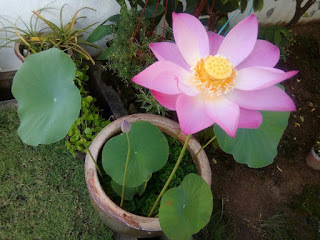 Around 6 months ago, a friend of mine from Kuala Lumpur visited me, bringing with her a lotus plant. 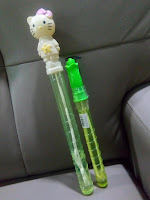 It was a gift from herself and another friend who initially grew lotuses as a hobby, which then turn into a business. At first, I was quite apprehensive in receiving such a gift as we never had a lotus plant at home before and I was concern that it will perish from neglect.